When it comes to chosing ingredients, I have high standards. small farmer, fair trade, and of course, quality in mind. Goat milk contains lots of nutrients like fats, proteins and other hormones that naturally benefit the skin. The benefits of goat milk soap can be felt by people suffering from various skin conditions or those just wanting to maintain youthful, rejuvenated skin. Goat milk soap has a pH level similar to human skin ; therefore, goat milk soap benefits the skin by protecting skin from daily bacterial and chemical invasions. The moisturizing benefits of goat milk soap surpass that of commercial soap because of the natural creams in goat's milk. Handmade goat milk soap benefits people with sensitive skin because it doesn't contain additives like alcohol, petroleum and preservatives. This reduces the risk of skin irritation and allergic reactions. 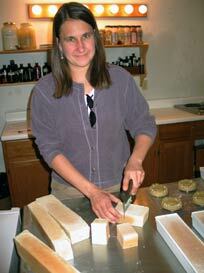 Goat milk soap benefits people with acne-prone skin because the proteins in milk kill acne-causing bacteria. Goat milk soap sloughs off dead skin because of the alpha-hydroxy acids found in the milk. Eczema, a skin condition caused by red, itchy skin patches, benefits from goat milk soap since the natural nutrients in goat milk moisturizes skin and reduces itchiness in the skin. Greece took for granted; that extra virgin olive oil, all by itself, is one of the best beauty secrets. In addition to being a natural, hypoallergenic way to moisturize skin, extra virgin olive oil has the added advantage of providing strong antioxidants, like Vitamins A and E that help repair and renew skin that has been damaged from overexposure to sun, air pollution, and other modern-day environmental hazards – like cigarette smoke and fast food. These antioxidants have the natural ability to stimulate cells and return skin to a firmer, smoother, and healthier state. To provide a slightly more scientific explanation, this damage is related to the destructive activity of oxygen-related free radicals produced by skin cells. Polyphenolic components of olive oil have been compared to traditional antioxidants, such as tocopherols, used by the pharmaceutical and cosmetic industry to prevent skin damage. There are a number of simple and inexpensive ways to get the best skin care and beauty benefits out of a single bottle of extra virgin olive oil. The rich emollients in olive oil allow just a little to go a long way. Whether applied to face or body, olive oil will penetrate deep into the skin and provide a long-lasting shield of moisture to keep skin smooth and supple. Used either as a night cream or daily moisturizer, it is best applied to damp skin, when water can help reduce any feeling of greasiness. We recommend using extra virgin olive oil. Expect the natural benefits of olive oil to take a bit longer to be absorbed into the skin than most lightweight packaged skin products. But the advantages can be longer lasting too. As safflower oil contains high amounts of polyunsaturated fats, it helps in creation of prostaglandins in the individual's body. These hormone like compounds aid in strengthening the cell membranes and also in the proper functioning of the body. One of the best health benefits of safflower oil is that it is an effective way of eliminating the excess fat accumulated in the body, thus helps in losing weight. Brown fat is present in several areas of the body which is a major factor that aids in burning calories. The cis-linoleic acid present in safflower oil gets converted into gamma linolenic acid (GLA) that triggers the brown fat to burn calories. Therefore, people who are looking for ways to lose as well as maintain their weight should include safflower oil in their regular diet. Another benefit of using safflower oil is that it helps in the reduction of the level of cholesterlol in the blood which reduces the risk of heart diseases in the individual. Apart from this, safflower oil is also said to strengthen the immune system of the body which increases its ability to resist the appearance of certain infections as well as diseases. Many doctors and dietitians recommend the use of safflower oil to obese people suffering from diabetes. Research has been conducted to find the benefits of safflower oil in older diabetic women who are overweight. These women were asked to take safflower oil supplements for a period of sixteen weeks, and the results that showed were entirely positive. It was not only observed that they lost excess fat, but there was also a significant decline in their blood sugar levels. Apart from diabetic patients, using safflower oil is an effective method of curing premenstrual syndrome. Consuming safflower oil instead of hormonal drugs helps in regularizing menstrual cycles, thus getting rid of the problem of irregular periods, something which is a very common in women these days due to various reasons. Apart from benefiting the hair, there are also many safflower oil skin benefits. People who have dry skin should use safflower oil which helps in moisturizing the skin, especially during winter, thus making it smooth and healthy. People are also recommended the use of safflower oil for acne treatment. Application of safflower oil on the skin helps in getting rid of other skin problems like scars, wrinkles, etc., along with acne. The benefits of grape seed oil can do wonders for your skin and health. The antioxidants in the oil are called procyanidolic oligomers (PCO’s), known for their health giving properties, and are more powerful than vitamin C and vitamin E.
Grape seed oil is made by cold-pressing the grape seeds, after they have been used to make wine. It is used in many facial and body care products, and is known for its anti aging effects. It is very rich in vitamins, minerals and protein, and can be found in many products such as; soaps, hair care, cosmetics, facial creams, body creams, bath oils, lip balms and anything else you can think of. Grapeseed oil contains polyphenols, which are antioxidants. Polyphenols can help slow the process of aging, as well as having anti inflammatory and anti oxidant properties, which makes it great for helping clear up acne. Using this oil will help prevent pores clogging and breakouts, it is good for oily skinas well. Using the grapeseed oil in skin care products helps to tone and tighten the skin. Grapeseed oil contains a high amount of linoleic acid, which is a fatty acid essential for the health of the skin and cell membranes. This is the reason why it makes such a wonderful moisturizer, as it really nourishes your skin helping keep it smooth and subtle. It is known for its ability to lock in moisture, leaving your skin feeling more supple and smooth, and it does not leave a greasy feeling, which makes it ideal to use on all skin types. The nutrients in grape seed oil are easily absorbed into the skin, instead of sitting on top of the skin, this also helps to fight free radicals and stop some of the enzymes that destroy collagen, elastin and other connective tissue. As it is a natural oil, it will inhibit problems such as fine lines and wrinkles, caused by the loss of collagen and elastin. Along with vitamin C, grapeseed oil is able to help the skin with the production of collagen. There are plenty of products you can use to smooth out wrinkles and fine lines, but most of these products are only temporary. Whereas, a natural oil like grape seed can offer a more permanent solution. As we age, our bodies produce less and less collagen, which is the cause of fine lines, wrinkles and blemishes. So, it makes sense to use a natural oil like grapeseed to help beat the aging process, and keep you looking younger. Grape seed extract is a way of taking it as a supplement, and has been extensively researched around the globe. Grapeseed oil is widely used in cooking by many great chefs, and becoming more popular for the health conscious, to have a bottle in their kitchen pantry, next to the olive oil of course! It is cholesterol free and will help lower low density lipoproteins (LDL), bad cholesterol, and raise high density lipoproteins (HDL), good cholesterol. You can use the oil for stir fries, marinades, salad dressings, baking and deep-frying. Until I did this post, I never considered using grape seed oil for cooking, I now use it all the time. Grape seed oil is largely used as massage oil, and gives great relief for the tired and stressed out body. If you are considering taking a supplement, take only the best, natural, synthetic and chemical free supplements. It is extremely important in this day and age, to buy from companies which strive to give its consumers the best, and the most natural, organic products. Remember, when taking grape seed oil supplements, you need to take them consistently over a period of time, to reap the benefits. Almond oil is a rich source of vitamin E and is beneficial in many ways. Almonds are treasures of some essential minerals such as magnesium and calcium. Almonds have high contents of fats. Raw almond oil enhances the taste of the food including salads, grains and toasts. Besides being a nutritious food, almonds have many cosmeticbenefits. Almond oil is pale yellow in colour and it is extracted from almond kernels. Apart from vitamin E it also contains vitamin D and other nutritious components. Sweet almond oil is one of the most popular essential oils used in aromatherapy. Pure almond oil can be used as carrier oil in aromatherapy or massage therapy. Almond oil is suitable for any skin type. You do not have to worry how it will react on your skin type. Listed below are benefits of almond oil for the skin. Beautiful Skin will be no more just a dream. Pour a few drops of almond oil in your palm. Dip your fingertips and apply gently on your scalp. Massage slowly in small circular motions and feel the comfort.Almond oil adds luster to the hair making them healthy. Due to cosmetic benefits of sweet almond oil it is used in many beauty treatments. Following are some benefits of almond oil. Every woman fancies beautiful locks and it is possible with the use of almond oil. Eating raw almonds can give you innumerable health benefits. There are many other uses of almond oil. Consuming almond oil is beneficial for digestive system. When used in aromatherapy it has calming and cleansing effects. Almond oil also releases pain. It is used as an effective painkiller. Following are some health benefits of almond oil. Vitamin E oil is one such naturally occurring oil which is soluble in lipid and is non-enzymatic. Vitamin E oil when applied on the skin, acts an an antioxidant which prevents the formation of free radicals on the skin and protects it from any kind of damage. It also has anti-inflammatory properties. Due to presence of such essential qualities, it is used on our skin for various purposes. Anti-aging: Vitamin E oil is a key ingredient of various anti-aging creams and lotions because of its anti-aging effect. It is useful for reducing the visible fine lines and wrinkles of the skin and thus makes the skin look younger. The antioxidant properties of vitamin E oil prove to be quite valuable for the this type of skin problem. When exposed to high temperature, the shelf life of vitamin E oil decreases. Vitamin E oil tends to react with oxygen and become ineffective. Therefore, in order to retain its essential qualities, it is necessary to store it in proper conditions. Also it is advisable to use this oil after consultation with your family doctor, so you can be sure you are using it in the correct way and for the right reason. Who would not like to have a smooth, supple skin topped off with silky, shiny and lustrous hair? For some time now, raw shea butter has been known to have exactly those glorious effects on your skin and hair! Shea butter is extracted from the kernel of the Karite tree that so far, is only found in Africa. The tree produces a green fruit that will fall off the tree when it is ripe. Inside the fruit are nuts and it is the seeds from these nuts that are used to make raw shea butter. Shea butter naturally contains vitamins A, E and F. Vitamin A and E are known to balance and normalize the skin. They are also both soothing and hydrating which is beneficial to the skin. Vitamin F consists of two essential fatty acids; linoleic acid and alpha-linoleic acid, both of which work to soften and revitalize dry skin and dry and damaged hair. Raw shea butter is known to maintain moisture and skin softness; and it is effective on dry, flaky skin as it tends to moisturize and hydrate. Raw shea butter is also used in shampoos and conditioners and is often used alone as a conditioner. It promotes shiny, soft hair and absorbs quickly and does not leave a greasy residue or clog your pores. Raw shea butter is wonderful for people with sensitive skin and has been known to help those with psoriasis and eczema. It is even great for babies and can be used to treat diaper rash. Many people even claim that raw shea butter will bring instant relief to insect bites. Here is a list of the essential oils we use and some of their properties. Cedarwood - skin conditioner, sedative, calming, acts as an astringent for oily skin. Cinnamon - stimulant, warming, antiseptic. Eucalyptus - expectorant, sore muscles, insect repellent. Lemongrass - sedative, can soothe headaches. Neroli - aphrodisiac, sedative, joyous and uplifting. Orange - calming, skin care, revives wrinkled skin. Patchouli - soothes dry skin, peace of mind, rejuvenating. Peppermint - cooling, headaches, sedative, antiseptic, acts as an astringent for oily skin. Rose Geranium - dry or oily skin, uplifting, refreshes body. Rosemary - stimulating, assists with loss of memory and mental fatigue, emotionally soothing. Sage - soothes aches and pains. Sandalwood - soothes chapped/dry skin, acne, aphrodisiac, and sedative. Lavender Luxury - with lavender flowers and lavender essential oil. Oatmeal Cookie -with honey, oatmeal and vanilla oil. Calendula Vanilla - with calendula flowers and vanilla oil. Daydream - with cornmeal and patchouli essential oil. Lemongrass Breeze - with dried lemongrass and lemongrass essential oil. Naked - pure soap, no oils or herbs added. Mountain Mint - with dried peppermint and peppermint essential oil. Hopeless Romantic - Jasmine and Vanilla oil with oatmeal- Wonderful! !